The full City Council just made it official: You will vote August 18th on whether to approve or reject the ordinance that would require a 20-cent fee to be charged for every disposable shopping bag you use. Without discussion, councilmembers voted 8-0 to put the referendum on the ballot (approving this item). TRASH/RECYCLING CHANGES: Today’s the day it all starts. If you’re like us and had Monday pickup before, they’re not supposed to show up till tomorrow. An online lookup tool is here (but it’s had a few reports of glitches). The recycling changes — more stuff can go in the bin, no more glass separation, etc. — are explained here. Remember that yard waste (including food scraps) is now picked up weekly. And if you’re confused, call 684-3000. SPRING BREAK: Reminder that Seattle Public Schools (and others) are out this week for spring break, so you’ll see lots more kids around. FOOD FOAM BAN YES, BAG FEE NO (FOR NOW): A note we just received suggests there may be a bit of confusion out there somewhere, even in some areas of the old-media world, about what took effect today regarding what was originally a two-part city ordinance passed last year — banning foam containers for takeout food/drink, and adding a fee for people who wanted disposable plastic shopping bags. 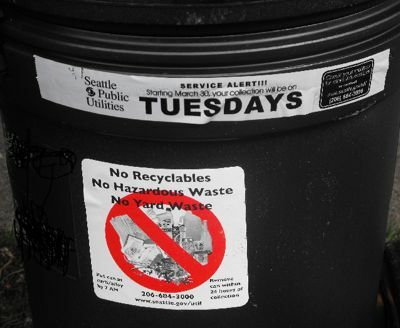 Because enough signatures were gathered for a referendum vote, as reported last September, the bag fee is on hold till a vote later this year (expected to be during the August primary), but the foam ban takes effect today – read more about it at this page of the Seattle Public Utilities website. To see some of the “commercially approved” alternatives you might be getting with your food/drinks, go here. … a stolen bike at corner of SW Trenton St & 32nd Ave on Monday morning 12/29. A thief took my 41 year old 10-speed (sentimental value = high) right next to two much finer bikes, which are now triple locked. Description: 10 speed with drop handlebar, bad silver paint, parcel carriers front and rear, old Huret Allvit deraillier, broken generator, new gumwall tires. If you spot that bicycle, please alert police. EARLY FRIDAY UPDATE: In comments, Maria posted a POSSIBLE sighting not far from the theft location – DP went to check, and indeed, it was the stolen bike! 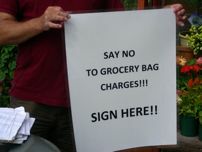 We told you three weeks ago that bag-fee opponents said they had 20,000 petition signatures – about a third more than they needed for a referendum vote; tonight two newspaper stories (PI here, Times here) say the county Elections Department has verified enough of those names are valid for the anti-bag-fee campaign to get what it wants. What’s next: The City Council decides whether the vote will wait for next August’s primary, or a special-election ballot sooner, and the bag fee/foam ban will be on hold pending referendum results. Side note per the P-I story – the plastics lobbying group American Chemistry Council paid almost $200,000 to help fund the petition drive. MONDAY MORNING UPDATE: Hizzoner is talking about this right now (9:37 am) on KIRO 710 radio (which streams online). Fifteen days after we showed you the first West Seattle signature-gatherer sighting, the anti-bag-fee campaign reports 20,000 petition signatures, about 33% more than they need to make the ballot, so it looks like we’ll be voting on it next year. As for when — as mentioned here last week, that’s up to the City Council; the first “special election” opportunity isn’t till February, a month after the fee kicks in. This just popped up on the LA Times Twitter feed we monitor (remember, you can follow us on Twitter, at westseattleblog; we also have set up a Twitter account for our partner site at whitecenternow): The “Save the Plastic Bag Coalition” has sued the Southern California city of Manhattan Beach over its plastic-bag ban, claiming the city failed to analyze environmental effects of the ban. In the same spot where we first saw a signature-gatherer with anti-bag-fee petitions eight days ago, by the southwest door at Thriftway, CoolMom.org co-founder Kristy Royce of West Seattle (with some help!) showed support for it this afternoon by giving out free reusable shopping bags. A group of north-end CoolMoms had something similar planned at a store in their area. Reminders about two events we’ve previewed here in recent days, both happening today/tonight: Supporters of the city’s upcoming disposable-bag fee plan to show their support for it by gathering at Thriftway in Morgan Junction between 3-5 pm (read previous coverage here); West Seattle residents concerned about train noise from Harbor Island and vicinity will meet with city and port officials at City Hall downtown, 5:30 pm (previous coverage here). Organizers of both events told us anyone interested in those issues is welcome to join in. Do 7-Eleven customers really use that many bags? FIRST, ABOUT THAT WEBSITE: Huge kudos to Blogging Georgetown, one of our favorite nearby-neighborhood sites, for going an important step further than we did in our report last night on the anti-bag-fee website: As you can read in this BG post, he looked up the StopTheSeattleBagTax.com URL registration, and notes that the domain was registered Monday, to … the American Chemistry Council. No surprise, as several commenters on WSB speculated along those lines, but it is a little startling that they didn’t bother to register the domain in the name of Washington Food Industry. We have sent a note to WFI spokesperson Jan Gee asking for comment on the Chemistry Council’s relationship to her group and this referendum campaign. This section of the ACC site has links about its previous efforts to stop this bag fee (and proposals in other states), including the radio commercial BG mentions. SECOND, ON A LIGHTER NOTE: Just got this link from West Seattle’s own “tea lady” Tracy (who closed her Admiral shop some months back to focus on her downtown Tea Gallery operation) — Her brother, syndicated comic-strip artist Keith Knight, took on plastic bags in his strip “The Knight Life” over the weekend. You can see it here. The ACC is a member of the coalition and was very active during the City’s public hearing process on this issue. Their membership includes the manufacturers and suppliers of many of our bags. We expect them to be very supportive of this effort including significant financial support. As an association of family owned businesses we don’t have the resources to meet all the demands Seattle places on citizen referendum. They also have an IT person and I don’t. We first told you yesterday about a petition drive to repeal Seattle’s upcoming disposable-bag fee (and foam ban) by referendum, after we encountered a signature-gatherer (toting the sign you see at left) outside West Seattle Thriftway. City law does not require such referenda to be recorded or even reviewed before signature-gathering begins, so we were having some trouble finding out who’s behind it — till two people (thanks to Alcina and Diane) just posted/sent word that the Puget Sound Business Journal reported about an hour ago, it’s the Washington Food Industry, a grocer-advocacy group. Went down the hill to Thriftway in Morgan Junction a short time ago; as we got out of our car, the gentleman you see in the photo above was a few steps ahead of us, heading for a spot outside the store’s southwest-facing door. 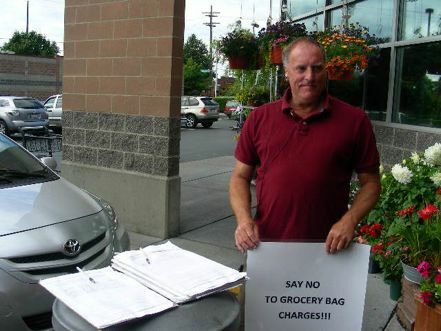 He identified himself as a paid signature-gatherer for petitions pursuing a referendum to cancel the 20-cent disposable-bag fee (and foam ban) just approved by the City Council (original WSB report, with 60+ comments, here). He said he wasn’t sure who’s sponsoring the referendum (we’ll be looking that up shortly), just that he’s got a contract to get paid to gather signatures. 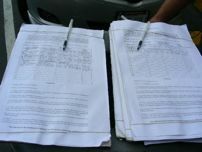 And from a quick look at the petitions (photo at left) after he’d been in business just about 15 minutes, he seemed to be having a success rate of almost one signature per minute. MONDAY MORNING UPDATE: Still trying to figure out how to find out who’s behind this. Found the city rules for referendums, and they note that you do not have to file anything in advance to circulate petitions – and you’re not supposed to bring them in till you think you have at least the required number (almost 15,000) – so this wouldn’t necessarily be on record anywhere.